The Grandparents StoryLab is highlighting grandparents who are running in this year's New York City Marathon as part of our marathon fundraising campaign. Listen to Jillian’s Story and Ben’s Story. Please donate to our campaign and help us grow our project. Jillian Lazaridis is a 73-year-old teacher librarian. She shows us the power of perseverance and that age is not a barrier to pursuing your dreams. Jillian was interviewed by Indykids journalists. Indykids is a newspaper produced by and for kids. Jillian ran her 36th NYC marathon in 2018. She’s run just over 50 marathons overall. Grandparents StoryLab Featured on NPR! 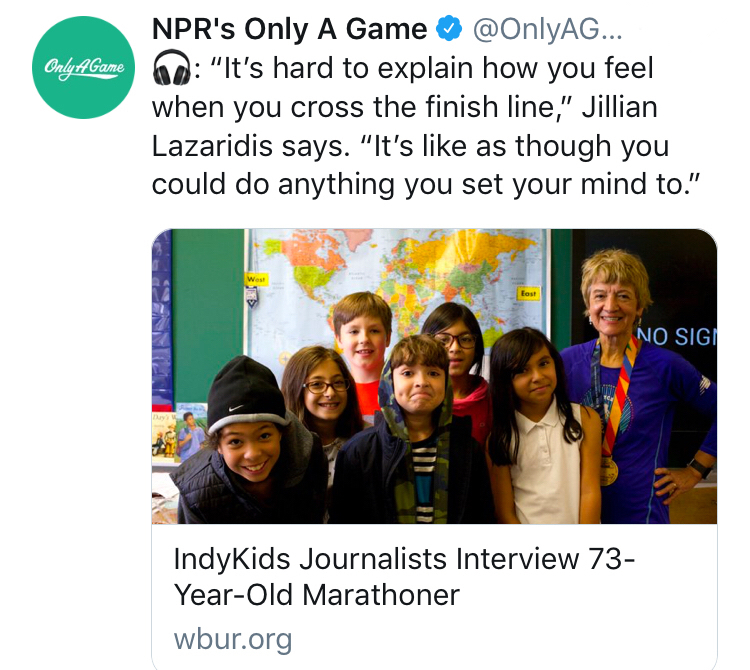 NPR's sports show, Only A Game featured our episode on 73-year-old marathon runner, Jillian Lazaridis. 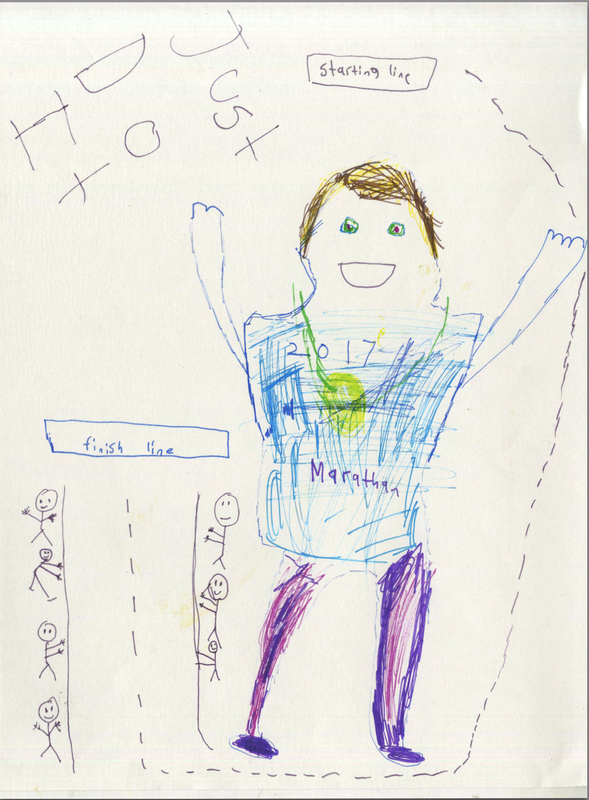 Listen to the podcast and see the children's artwork illustrating Jillian’s story. So my I was baptized. Evangelia is quite a mouthful. My friends in English would say, “Evangelia what kind of name is that. ?” So then my Macedonian name is Jilla. Jilla which is pretty close to Jillian. At this stage I had learned Jack and Jill went up the hill to fetch a barrel of water... So I came, Jill, Jilla, Jill and then decided Jill was not sophisticated enough so I became Jillian…Just because of Jack and Jill went up the hill. I hope you're all sitting down. I'm very old. I'm 73. I run five days a week usually. Training for the marathon I usually do my little three miles, four miles, six miles and then one day, every two weeks, every fortnight, I would do a long run. So I would start off with six, eight, twelve, fifteen, eighteen. I live near Central Park. I run in Central Park. It's just wonderful. You have squirrels, you have birds you have people, it's a very very exciting park. It's very active and very very inspiring to. “How many marathons have you done? Not just NYC but around the world,?” asked William. I have to estimate how many I won't count them now because you want to know how many marathons I've done in total. I would say it's about 50. “So when you're running marathons do you feel relaxed and happy that you're just doing this or do you feel like tension and scared that you might not finish. Or you might like get hurt or something?,” asked William. I feel all those things when you're running. I feel happy. I feel ecstatic. I feel afraid. Will I be able to finish the marathon? That is a concern. When you're running a marathon. Nobody can run it for you. So it's just yourself. When I run I play games with myself. For example, when I’m at 5km or 3miles I will have a little treat and then another 3miles, I'll have another treat. What do you do with your dog, when he doesn’t want to move it. You give him a biscuit. So and then when I'm running... I plan things, I visualize things and it's not easy... but life is not easy… right? You know if you wanted to be a musician you have to work really really hard. So it just makes you very very strong. I was born in Europe, Greece. It was near the Yugoslav border. When I was 9 and a half we caught a boat to Australia. I remember when we got off the boat we came in at night and just imagine... I lived in a little village where there was no electricity, no running water.. and then as we're coming by sea, I see all these twinkling lights. That was Melbourne. If you had never seen lights and you saw them, what would you think? They could be stars.. yes... Candles .. Fireflies... Yes... I thought it was fairyland. I thought that we had come from my little tiny village where once the sunset was it. You would walk around with a candle. I remember coming in to Port Melbourne, that's where the ships docked and then we got off the next morning and my mother's sister was waiting, we could see our relatives waiting for us…Ah… You bring back happy memories for me. “What medal are you wearing,?” asked Talia. It's last year's marathon medal, 2017. “When you run these types of marathons is there's a certain feeling you have, do you feel proud?” asked Abigal. You know it's hard to explain how you feel when you cross the finish line. It's like you could do anything you set your mind to and I tell my friends they should run a marathon, one marathon in their lifetime. This Grandparent’s StoryLab workshop was held with IndyKids, a social justice news source created by and for kids. The children interviewed Jillian and drew the pictures depicting her story. The final drawing for the piece came from another workshop run by a parent at their home.